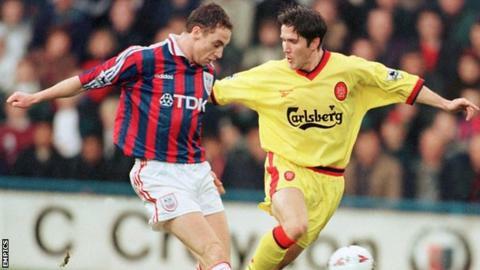 Notts County have appointed former Crystal Palace midfielder Jamie Fullarton as their new manager. The 41-year-old makes the step up into management after spells coaching at Palace, Bolton Wanderers and most recently Nottingham Forest. He has signed a deal until 2019 after Ricardo Moniz was sacked last month with the Magpies 15th in League Two. The former Scotland U21 international also played for St Mirren, Dundee United, Brentford and Southend. Notts County chairman Ray Trew said: "I don't think I have ever been as impressed by someone at an interview as I was by Jamie. He had us all captivated throughout what turned out to be a lengthy assessment of his suitability for the role." The Magpies have lost one game since Moniz's departure, a 4-2 defeat by Oxford, and are now 18th in the table - nine points off the play-off places.